I don't get excited about too many things. When I plan to fish in Boone, I can't help but be happy. It makes my week worth while. I've started tying the flies I will use and I'm figuring out which streams I will fish. I'm taking a buddy and it will be his first time fishing in the mountains of Boone. I don't think he'll want to come back. I love showing people trout fishing. I think anyone can understand how fun it is compared to fishing in a lake or pond. Those places are fun, but fishing in a stream is more of an active experience. You're wading the whole time and searching for fish with each step. You never leave the line in the water for more than 30 seconds. You wouldn't be suprised if you made 500casts in one single trip. 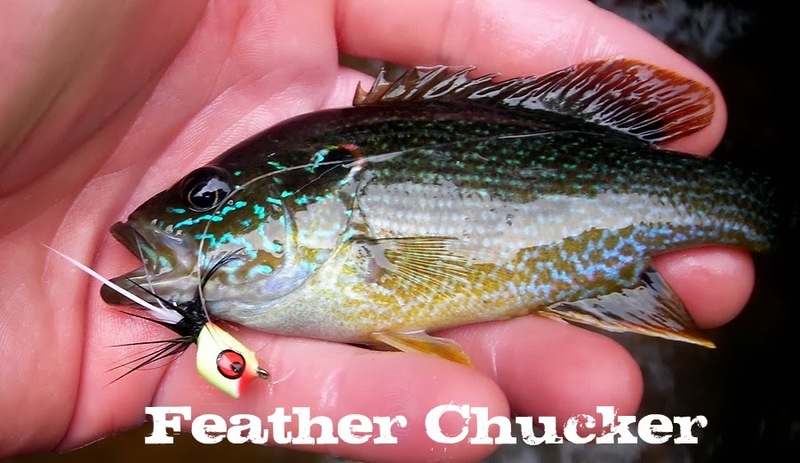 You use flies that you think will most likely match what bugs are flying around. But most likely you will go to your favorite fly and give up logic from all the fly fishing books you've ever read. Navigating the water can be fun too. Stepping on ice slippery rocks and tap dancing while trying to keep your balance while not throwing your rod in the water is a talent. Usually your cell phone doesn't work where you're fishing so if you knock yourself unconcious or drown no one will ever know. It's really kind of an extreme sport. You have to cast while shooing away wasps, horseflies and other pests. You walk threw tick filled brush to get to different fishing spots. Wearing waders and a hat isn't the coolest thing you can wear, you'll get hot even standing in 5ft of water. You can easily go from releasing a fish and smiling like you one a milliion dollars to getting a hook stuck in your thumb and cussing like a construction worker who stepped on a nail. Believe it or not it's fun. One thing I've noticed while fishing the rivers here is how different the experience is. In the mtns you always have the rush of the water as a soundtrack to your fishing experience. Sometimes it's fast and sounds like the static of a TV not finding its signal. Other times it's slow and flowing, sounding similar to water splashing around a pool. When you fish in Raleigh, you hardly ever hear the water. You usually walk beside the water watching turtles sun themselves on logs. As you get closer they plop into the water. Occasionally you'll see a beaver or muskrat cross the river or poke it's head up by a tangled mass of wood. Birds fly in both places and you'll probably see a heron fishing in either the mtns or Raleigh. 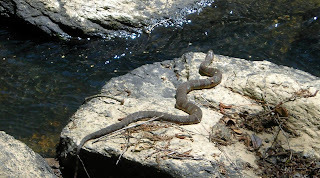 You'll also see the usual water or rat snake. 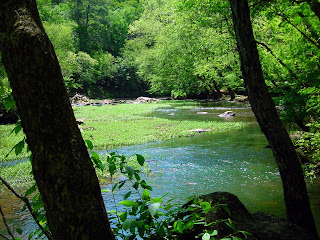 The mtn streams have gin clear water, where the Neuse and Eno have a brown muddy tint to it. Both places have their beauty to them. The Nuese has the surface activity of splashing gizzard shad here and there. The Watauga and other mtn rivers have the flash of sucker fish feeding on the bottom. I've learned to love the difficult fishing waters around Raleigh. They have taught me how to enjoy the river for what it offers in nature and not just fishing. I want to bring my camera instead of my fishing rod many times but the thought of not having my rod and seeing a huge fish are to over powering. I will try to get some pictures of us fishing this weekend. Everything is looking good for this weekend. The weather forecast is looking perfect. I'm hoping this will be the trip to hold me over until the fall when I can trout fish some more. I couldn't get anyone to fish with me today. The weather was so beautiful I decided it was too good to pass up and just went by myself. Today was the day to hit the Eno. After viewing maps and figuring out where exactly I wanted to go, I figured the Cole Mill section would be the easiest to get too. After a quick 40min drive I was at the Cole Mill parking lot and putting on my waders. I asked someone how far the water was, they said it was about a stones throw. I eagerly grabbed all of my gear and walked down the trail. The guy wasn't joking the river was literally 100ft from the parking lot. It wasn't moving too fast and I could tell from the view between the trees that it wasn't deep. I forgot this time of year the question is not whether or not you're going to see a snake, it's how many are you going to see. I stepped into the water and scared the snake away, I watched for it out of the corner of my eye while looking for water that looked like it could hold fish. I found lots of pockets but nothing really deep. I went with a emerger pattern and drifted it threw a few runs, instantly a little fish tagged it and came off before I could bring him in. There was a lot of grass on the bottom but only in certain sections. The water was clear but had a tint too it. It reminded me of beer. I spotted a decent pool that had to hold fish in it. After a few casts I caught a little sunfish. Then noticed that on almost every cast some fish would look at my fly, minnow, sunfish, little bass. The bass seemed to pick at the fly but would never take it. I caught a few more sunfish then moved to deeper water. It was here that I caught a decent sized one. The Eno has a nice path and there were plenty of hikers enjoying the day as well. There were so many that if you needed to relieve yourself it would be hard to find a private place to do it. The path is well worn and gives a good view of the river the whole time. I spotted some decent large mouth bass and sunfish. I fished a few more sections and lost some decent fish. The key to catching anything seemed to be placement of the fly. I don't think it really mattered what you were using or presentation. It seemed to be the cast that was the most important. The sunfish seemed to key in on the fly after it was falling in the water. I'll definitely be back to this river. It's too close and good a fishery to pass up. This blog has really been getting neglected. 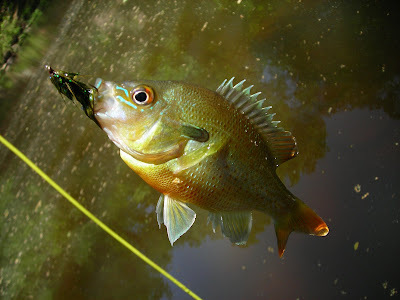 Good news, I went fishing over the weekend and the bluegill ponds by my house are heating up. Bad news, I've only taken the kayak out once on the lakes around here and I haven't fished a big river in awhile. I might have to go to Boone this weekend and get my trout fix. Either that or hit the Eno. I've never been there but heard great things about it. Its been hard to make time for school, rock climbing, hanging out with friends, the wife and then fishing. The days are getting longer, but the plant growth is getting worse. The trails that were easy to navigate are now over grown and the paths are unrecognizable. You still know where they are but now they are lined with poison ivy, briar bushes and who knows whatelse. I will just have to man up and brave it one of these days. It's easy right now to go to my local pond and nab some little gills. The Eno is enticing to me and it's only a matter of time before I get there.